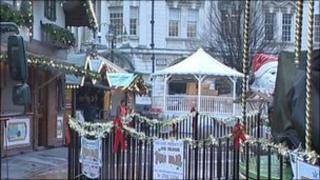 A record number of people visited Birmingham's Frankfurt Christmas market this year, the city council estimates. Preliminary figures show the largest market of its kind in the UK attracted 3.1 million, beating last year's figure of three million, a spokesman said. It opened in Victoria Square and New Street on 18 November for the 10th year and drew to a close on Thursday. Stallholders donated leftover perishable goods and loose change to charity. Final visitor figures will be confirmed next month, the spokesman added. Last year's event boosted the city's economy by £89.6m, the council said. The Democratic front-runner denies treating a woman badly in a 1991 sexual harassment hearing.